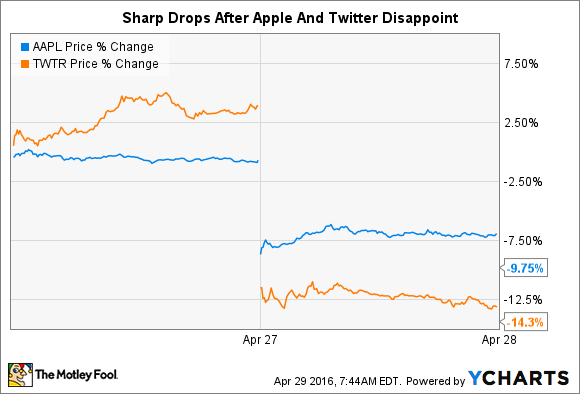 Better Buy After Earnings Selloff: Apple Inc Or Twitter? Can you benefit from the now-cheaper prices after Apple and Twitter's post-earnings selloffs? In the investing world, one trader's trash is another investor's treasure, and we staunchly believe short-term blips can create long-term opportunities for patient investors. Are there any such opportunities here in the wake of Apple and Twitter's earnings sell-offs? Let's find out. As we all expected, the streak is officially over. Apple's run of consecutive quarters of sales growth, which dated to 2003, came to an end with a 13% decrease in sales. Top to bottom, the quarter wasn't particularly inspiring. iPhone revenue, which accounted for two-thirds of sales, sank by 18%, and iPad sales fell by 19%. After helping fuel much of Apple's growth in the recent year, Apple's Greater China reporting segment saw sales decline a grizzly 28%, though foreign exchange headwinds negatively affected Apple in general for the quarter, eroding top line earnings by 4%. Beyond the iPhone, the iPad and Mac both experienced revenue contractions during the quarter. iPad revenue shrank 19% year-over-year, and Mac sales declined 9%. It wasn't all doom and gloom though. Apple's Service and Other Products divisions both grew during the quarter. Services revenue rose 20%, while other Products Sales increased 30%. Importantly though, combined revenue from Services and Other Products represented only 14% of Apple's total sales for the quarter. Overall, the quarter produced far more negatives than positives. Equally alarming, Apple forecast continued weakness facing its business, projecting sales in its current quarter to total between $41 billion and $43 billion, solidly below the consensus expectation of $47 billion. For context, the mid-point of Apple's current quarter guidance represents a year-over-year sales decline of 15%, giving rise to a new streak of consecutive quarters of sales declines. At the same time, looking to the back half of calendar 2016, plenty of reasons for optimism abound. The main selling point is the forthcoming form factor upgrade with the iPhone 7, which Apple bulls see as triggering a torrent of handset upgrades and a return to growth. I'll expand on the case for this lower, but first, let's dig into the particulars of Twitter's earnings miss. Earnings from the evolving microblogging platform served as a metaphor for the company as a whole. In some regards, Twitter looked solid, while leaving something to be desired in other areas of its business. Let's start with the positives, of which two are of particular importance. For starters, user growth returned for the company. I, and many others, have waxed poetic about the urgent necessity for Twitter to expand its user base if it indeed ever plans to return to the kind of high double-digit revenue growth consistently produced by social media rivals like Facebook. For the quarter, Twitter expanded its base of monthly active users (MAUs) from 305 million last quarter to 310 million. Equally attractive, Twitter produced $0.15 in non-GAAP earnings per share, meaningfully outperforming analysts' average expectation of $0.10 per share. It's also worth noting that Twitter remained unprofitable on a GAAP basis. For the quarter, Twitter grew its top line 36% to $595 million. This might sound like good news to you, and I'm actually inclined to agree; however, it trailed Wall Street's expectation of $608 million in sales for Twitter. Compounding this soft revenue figure, Twitter issued second quarter guidance ranging from $50 million to $610 million, markedly lower than the $678 million analysts had hoped for. This classic one-two punch of missed revenue and disappointing guidance is enough to trigger a sell-off in most tech stocks. Given Twitter's recent struggles, the negative response wasn't especially surprising. Though I remain intrigued by Twitter's long-term potential, Apple's forward-looking bull thesis remains more clear-cut. True, Apple's current quarter guidance pointed to a sharper-than-expected contraction in sales. On one hand, this could signal a broad-based decrease of interest in Apple products. However, given Apple's strong history of brand loyalty, it's more likely that many would-be iPhone buyers are instead opting to delay their handset purchases until the next-gen iPhone reaches market. Though Apple enjoyed a tailwind of rapid smartphone market growth, the company produced record-setting performances in the first full fiscal quarters after the past two iPhone form factor revamps. Apple's product cycle is relatively well understood at this point, meaning this coming growth catalyst could quite conceivably be priced-in in the months preceding the new iPhone form factor. Point of fact, Apple stock tends to trounce the market over the six months prior to a new iPhone design hitting the market. Twitter on the other hand remains a far less certain candidate to reverse its continued stock slide. It's fairly clear at this point that the key to Twitter's continued expansion lies in adding new features to attract first-time users. At present, the bulk of Twitter's new product launches since Jack Dorsey resumed responsibility as full-time CEO have been incremental in nature. Dorsey and his evolving executive team have plenty of runway, but they'll need to prove they have the vision to bring Twitter 2.0 to market in order to fully restore the investment community's faith. Again, this certainly can still come to pass. It just remains an unlikely scenario compared to Apple's likely return to growth with its next iPhone, making Apple the better bet in my eyes at the moment.